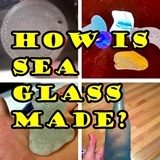 How do you know what is genuine sea glass and what isn't? 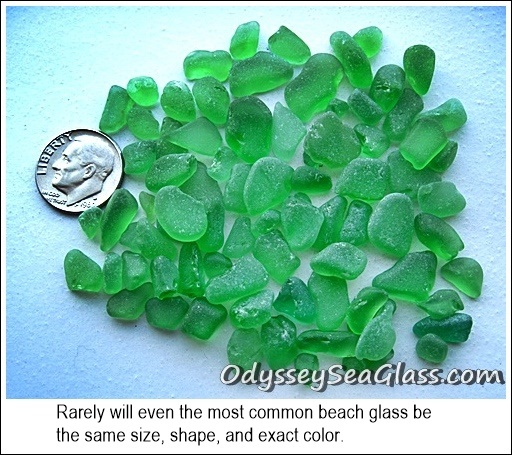 The very important information on this page and detailed on Odyssey Sea Glass pages can help you identify authentic, real sea glass. Why is this information important to you? You can avoid purchasing imitation sea glass jewelry or a collector's piece that is not authentic sea glass. If a quantity of sea glass exactly the same color is being sold, there is a good chance it is fake. While the most common colors, like the green show above, superficially seem to be the same color, close inspection will show a variety. This is real sea glass. Just as a bank teller learns to recognize counterfeit bills by studying authentic bills, your eye will become trained to recognize counterfeit or imitation sea glass that might be sold as real sea glass. Click the highlighted links as you read, then click the back button to return to this page. The guidelines below are generally true, but there are exceptions. In the photo of real sea glass above, you are seeing real sea glass. This many cobalts is pretty rare; however, at Glass Beach, Washington, many tinies like this can be found. 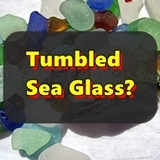 Beach Glass - naturally wave-tumbled and frosted glass found on fresh-water or salt-water beaches. 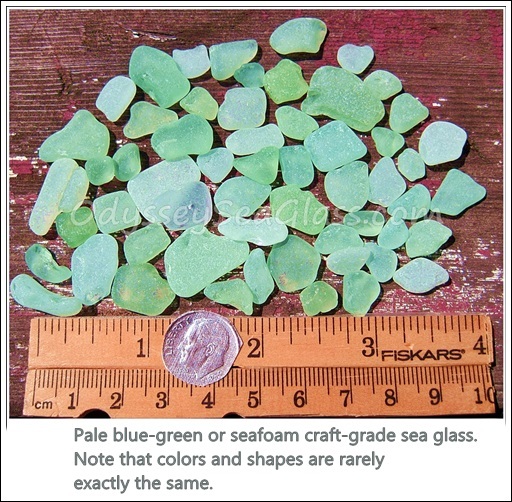 If the pieces of cobalt-colored glass were larger than a dime, you would be wise to suspect "faux" (fake) sea glass. There's nothing like an early morning sea glass hunt - here's our poster with sea glass we found early morning on a Washington hike. Genuine sea or beach glass will be found in larger quantities mainly in the common colors: white, green, and brown. By larger quantities, we're talking about maybe a pound or two. Rare colors are not sold in bulk and are quite expensive. 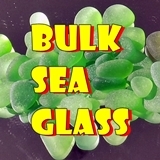 If you see these colors sold in bulk, it is almost positive that they are imitation, fake sea glass pieces. 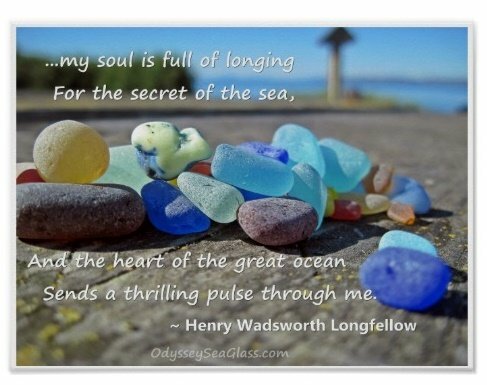 If you see a bunch of pieces of sea glass the exact same unusual hue, size, shape, and color, it is imitation sea glass or beach glass. Above are shown some of the more rare glass colors. The marble is just give an idea of the size of these pieces. Individual rare pieces will sell for a comparatively high price, far above the common colors. Pieces of authentic sea glass are nearly never the same size or shape. A good grade of real sea glass will have very rounded edges. Sharp corners and edges will have disappeared. Several pieces of sea glass the same basic color will usually vary in the amount of "frost" on the surface. It is also usual to find tiny C-shaped chips in the surface of genuine sea glass. Imitation or machine-tumbled sea glass will often have a totally uniform frost but of a superficial depth. If the pieces all have exactly the same amount of "frosting" this is an indication of fake seaglass. Genuine sea glass, on the other hand, due to varied minerals in the glass and leaching of those minerals, effects of exposure to sunlight, and other physical factors will have deeper facets on the frosted surface; in other words, thicker frost. Genuine sea glass might be available for purchase in larger sizes mainly in white, beer-bottle brown, and wine-bottle green. On the other hand, it is not common to find any well-tumbled natural sea glass above 3-1/2 to 4 inches in length - during the time it takes to tumble among the sand and rocks, it generally breaks down into smaller pieces. The more rare colors are almost always less that 3/4 inch in size and sold individually or in small groups. Cobalt blue, for example, a fairly-rare color, seems to be more brittle or weaker than the common colors. Also, cobalt blue was used mainly for small medicine bottles. 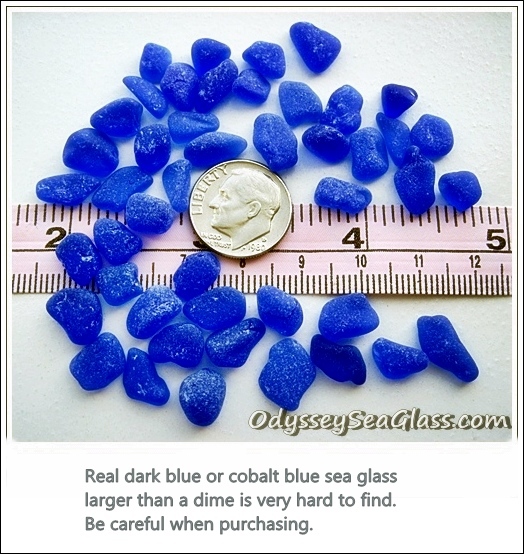 Therefore, the chance that you would see genuine cobalt blue sea glass over 1/2 inch in any quantity would be quite unusual. 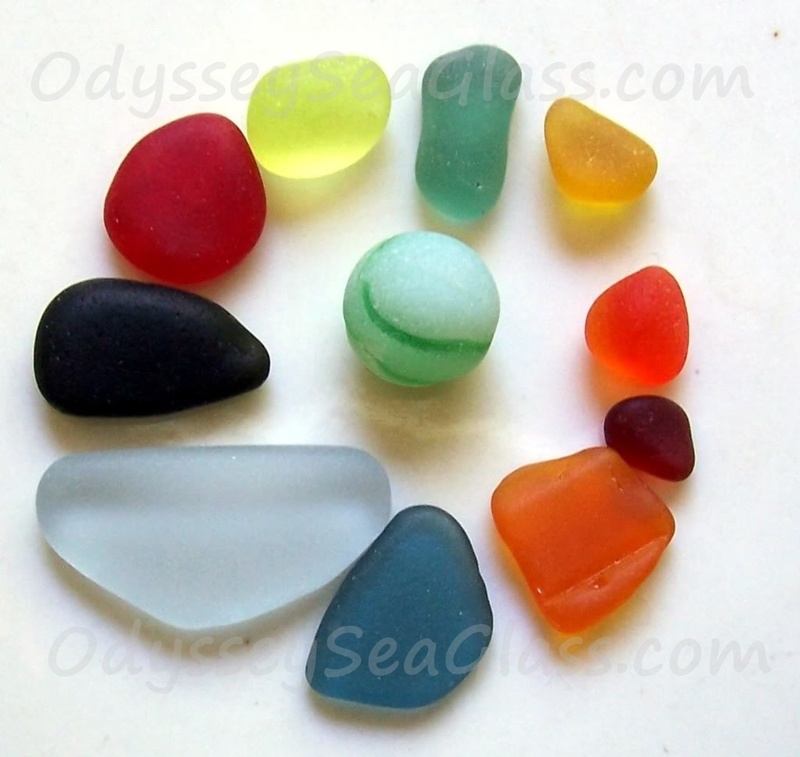 Pieces of sea or beach glass in the less common hues of even the common colors are generally not large in size. Again, the above guidelines have their exceptions. 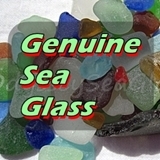 Learn what authentic sea glass looks like by studying the many photos on this site. Don't be taken in by falsely-advertised "sea glass" that will be a disappointment and waste of money in the future.